Way before we arrived in HongKong, lo kong was already looking forward to having dim sum. 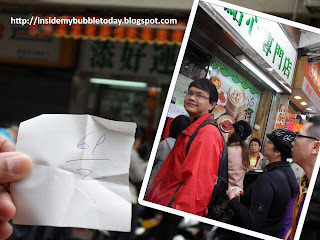 He had scoured the net for the nearest popular dim sum outlet to our hotel and voila! First thing the next morning of our arrival, we were already heading towards Mongkok. 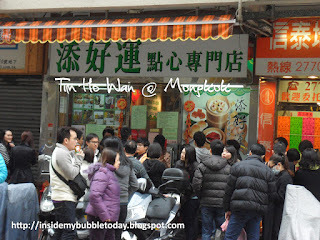 The dim sum outlet, Tim Ho Wan is located at 2-20 Kwong Wa Street, Mongkok, Kowloon. This is the original restaurant aside from 2 other outlets in other parts of HongKong. What seemed like a simple direction to place ended with us walking in circles looking for the place. Anyway, this one-starred Michelin restaurant that serves fresh steaming dim sum in many varieties is located just behind the Kwong Wa Hospital. Lo kong had read that we will need to take a queue number before we can be seated and there is normally a long queue outside the outlet. When we arrived, I wouldn't exactly call what I saw a long queue but a big crowd. Imagine I had complained about the 6am crowd at Foh San Ipoh recently ... this was worst and it was all day long! Lo kong was given the number 69 and told to return 2 hours later. It was already 11.30am and what was supposed to be our breakfast is going to be our lunch! We finally returned to the restaurant in almost 2 hours to face a persistent crowd. We still had to wait some half-hour to be seated and meanwhile we were given an order list to make our dim sum selection. When we were finally let in, we had to share tables with others. We had to sit side by side as both of us had to share on 2 separate tables. The place was so cramped and crowded, it was not comfortable at all to truly enjoy our dim sum especially with strangers staring straight in your face. Lucky thing, the delicious food made up for the discomfort and the price very reasonable. Unlike the 3 girls from mainland China that I shared the table with, we only ordered selectively in order not to overeat. As these girls struggled and stuffed themselves with the continuous flow of dishes coming to them, I figured they must have ordered everything on the menu! Here's a little teaser of what you can expect at Tim Ho Wan.